Item number 2615/11 from the MOA: University of British Columbia. 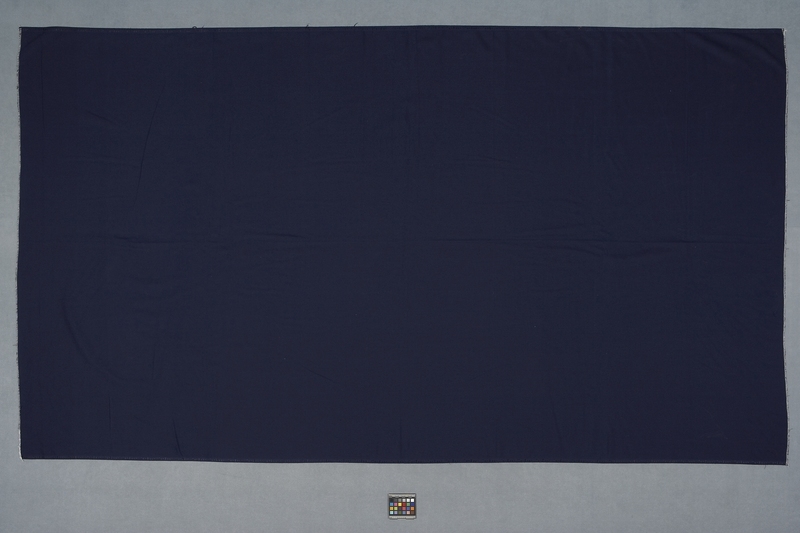 Large plain blue dress cloth made as a wrap around skirt. Shortest sides are machine edged with white thread. Longest sides have a thin border of geometric designs in shiny dark blue thread. Skirts of this type were worn by women of the Hindu Koli caste. Members of that caste assisted in the production and gathering of this clothing. The cloth for the clothing was purchased in Kodinar town, 7 km. to the east of Dhamlej. Skirts of this type were also worn by women of other castes. Koli women also wore distinctive jewellery, including small bracelets called bangli in Gujarati made of plastic or gold, silver ankle chains called chhdi, solid silver anklets called sakada, and large gold nose rings called kadi. Cut and machine-sewn by a tailor. The type of clothing helps to communicate the caste of the wearer. This dress cloth was collected with the help of Hindu Koli people. This collection was gathered with the enthusiastic participation of villagers in Dhamlej, reflecting Derek Johnson’s rapport with them. They allowed him to take photographs of them demonstrating how the clothing is put on and worn. These photographs are available in the Museum of Anthropology collection documentation file for accession 2615.
dye, synthetic fibre ? and cotton fibre ? dye fibre, synthetic ? fibre, cotton ?